In Hinduism, the goddess Durga, also known as Shakti or Devi, is the protective mother of the universe. 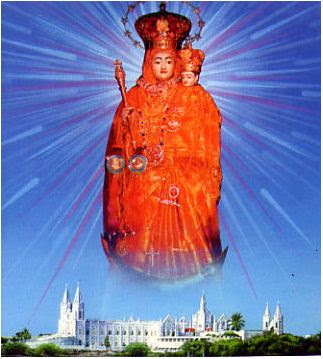 She is one of the faith's most popular deities, a protector of all that is good and harmonious in the world. 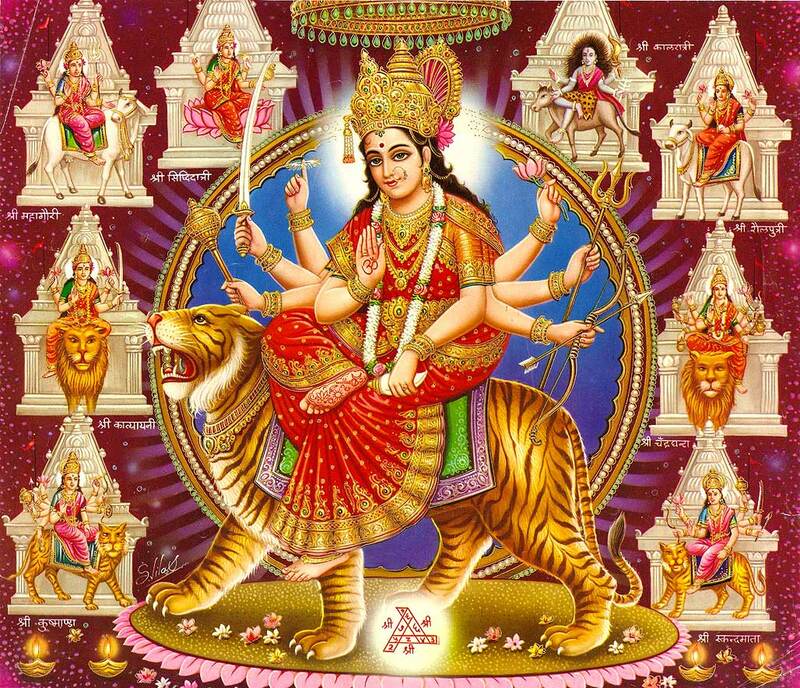 Sitting astride a lion or tiger, the multi-limbed Durga battles the forces of evil in the world. In Sanskrit, Durga means "a fort" or "a place that is difficult to overrun," an apt metaphor for this deity's protective, militant nature Durga is sometimes referred to as Durgatinashini, which literally translates into "the one who eliminates sufferings." In Hinduism, the major gods and goddesses have multiple incarnations, meaning they can appear on earth as any number of other deities. Durga is no different; among her many avatars are Kali, Bhagvati, Bhavani, Ambika, Lalita, Gauri, Kandalini, Java, and Rajeswari. 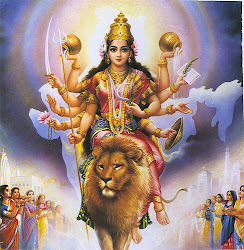 When Durga appears as herself, she manifests in one of nine appellations or forms: Skondamata, Kusumanda, Shailaputri, Kaalratri, Brahmacharini, Maha Gauri, Katyayani, Chandraghanta, and Siddhidatri. 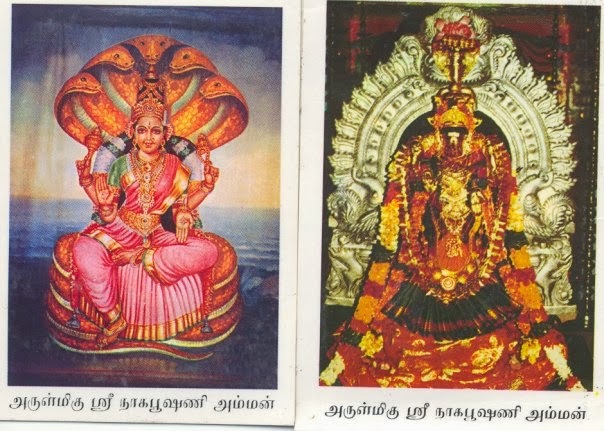 Collectively known as the Navadurga, each of these deities have their own holidays in the Hindu calendar and special prayers and songs of praise. Befitting her role as mother protector, Durga is multi-limbed so that she may always be ready to battle evil from any direction. 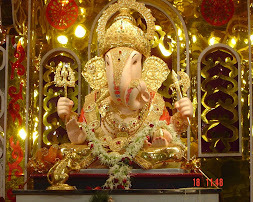 In most depictions, she has between eight and 18 arms and holds a symbolic object in each hand. Like her consort Shiva, the goddess Durga is also referred to as Triyambake (the three-eyed goddess). Her left eye represents desire, symbolized by the moon; her right eye represents action, symbolized by the sun; and her middle eye stands for knowledge, symbolized by fire. The conch shell symbolizes the Pranava or the mystic word Om, which indicates her holding on to God in the form of sound. The bow and arrows represent energy. 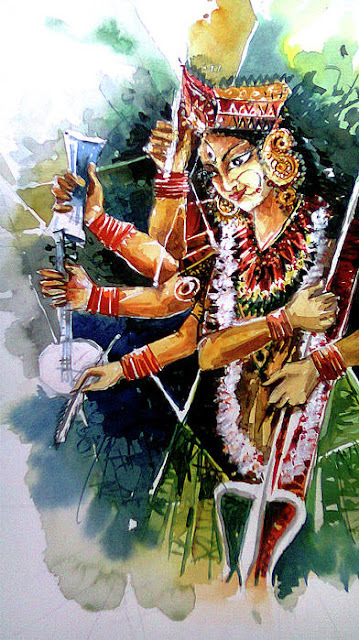 By holding the bow and arrows both in one hand, Durga demonstrates her control over both aspects of energy—potential and kinetic. The thunderbolt signifies firmness in one's convictions. 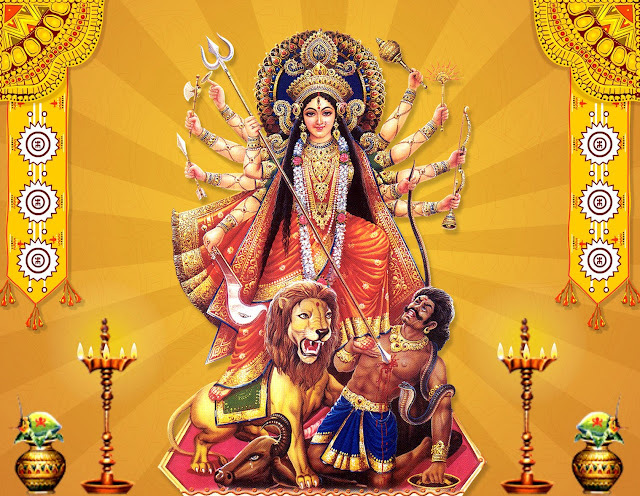 Just as a real bolt of lightning can destroy anything it strikes, Durga reminds Hindus to attack a challenge without losing confidence. The lotus in Durga's hand, not yet fully in bloom, represents the certainty of success but not finality. The lotus in Sanskrit is called Pankaj, which means "born of mud," reminding the faithful to stay true to their spiritual quest amid the worldly mud of lust and greed. 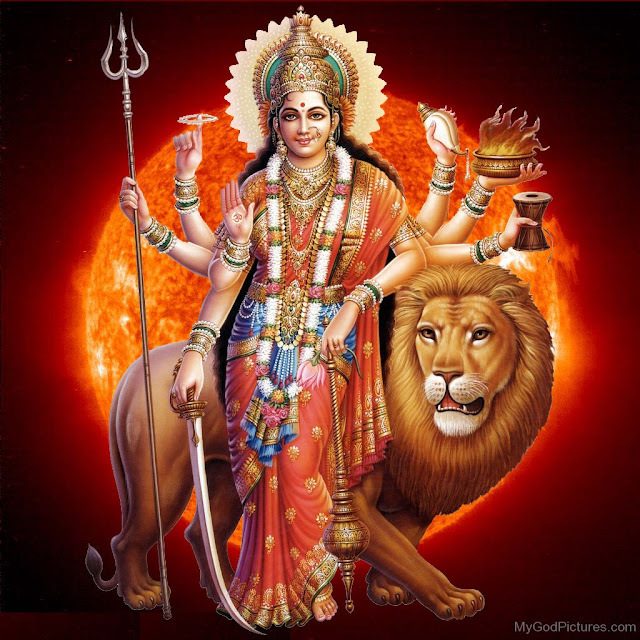 The Sudarshan-Chakra or beautiful discus, which spins around the index finger of the Goddess, signifies that the entire world is subservient to the will of Durga and is at her command. She uses this unfailing weapon to destroy evil and produce an environment conducive to the growth of righteousness. The sword that Durga holds in one of her hands symbolizes knowledge, which has the sharpness of a sword. 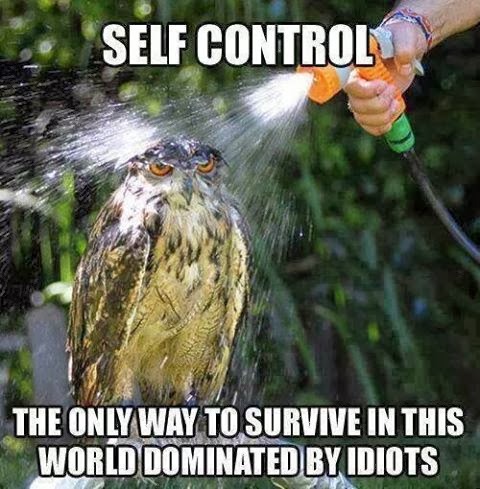 Knowledge free from all doubts is symbolized by the shine of the sword. The trident or Trishul is a symbol of three qualities: Satwa (inactivity), Rajas (activity), and Tamas (nonactivity). Deva uses these to alleviate physical, mental, and spiritual suffering. In Hindu art and iconography, Durga is frequently depicted standing atop or riding a tiger or lion, which represents power, will, and determination. 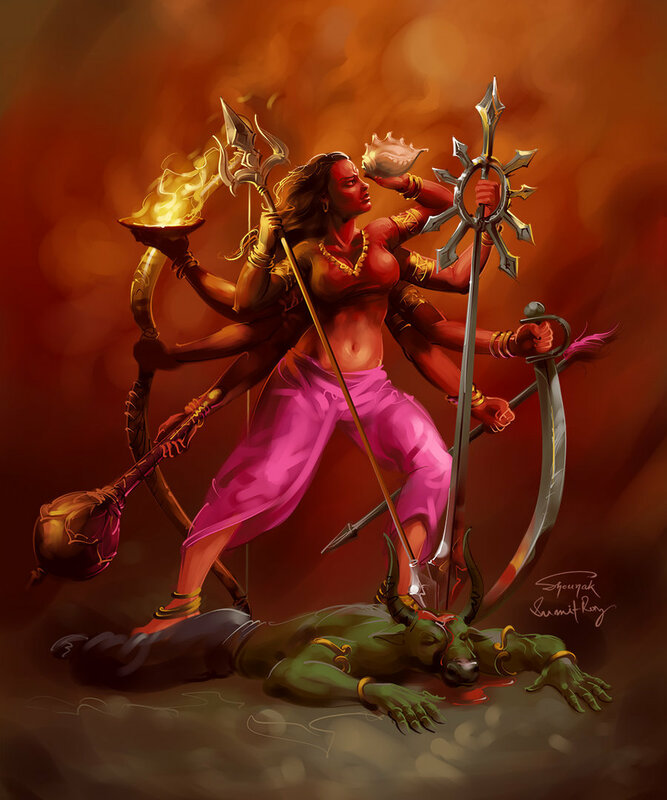 In riding this fearsome beast, Durga symbolizes her mastery over all these qualities. Her bold pose is called Abhay Mudra, which means "freedom from fear." 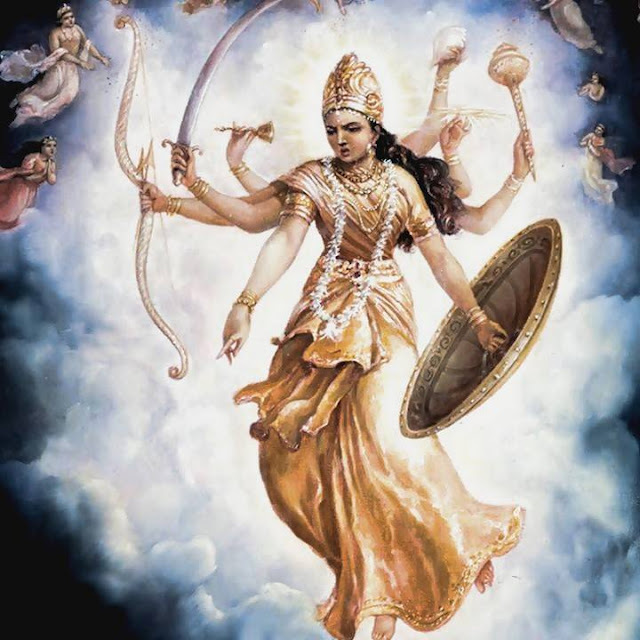 Just as the mother goddess confronts evil without fear, Hindu scripture teaches, so too should Hindu faithful conduct themselves in a righteous, courageous way.